Sakai Guides and DocumentationSakai Complete User Guide PostEmHow do I update a PostEm feedback item? Select the PostEm tool from the Tool Menu of your site. Note: The PostEm tool is sometimes named Feedback. To update the feedback file, click the update link. 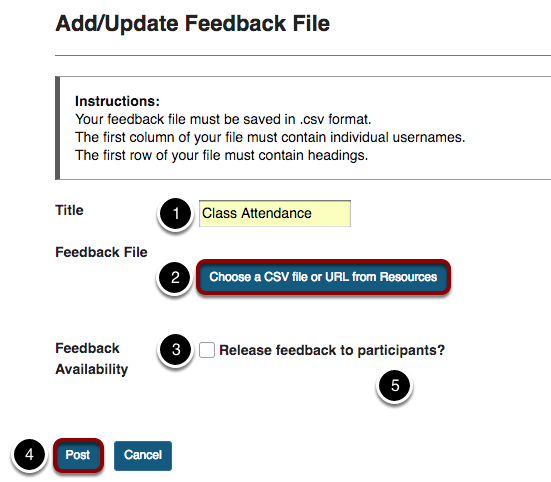 Zoom: Instructor view of feedback items list with update link highlighted. If you would like to update the item title, replace the CSV file with a different file, or adjust feedback availability, click the update link. Select a new file and Post. Adjust item Title, if needed. Click the Choose a CSV file or URL from Resources button to select a different file. This allows you to replace the current CSV file with a new file. Adjust Feedback Availability, if needed. Click the Post button to complete the update. Prev: How do I add PostEm feedback? Next: How do students view their feedback in PostEm?